On average, 30 cents of every $1 spent on cooling your home disappears into thin air due to duct leaks. Those 30 cents add up to a substantial amount every month. Put that money back into your bank account with a proper duct sealant service from Acree Air Conditioning. How Do You Know That Your Home Has Poorly Sealed Ducts? Tape & Mastic – Most companies will offer to seal your ducts using tape and mastic sealants. Although these are common, they are very ineffective as the tape won’t last and there is no way for you or the technician to know whether the ducts were actually sealed air tight. If you do decide to seal your air ducts using tape and mastic sealant, stay far away from duct tape. 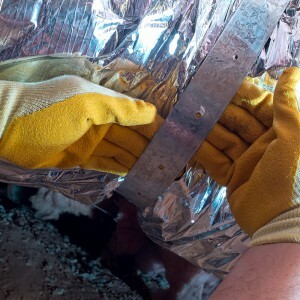 Despite its name, duct tape is a very ineffective way of sealing your air ducts. Use UL-listed aluminum foil tape of HVAC mastic sealant instead. Replace the Ducts – Replacing your ductwork can be effective at eliminating duct leaks as well as improving overall comfort in your home, however replacing your ducts can be expensive. If no testing is performed, there is no way to ensure the new ducts are sealed airtight. Aeroseal Duct Sealing Technology – Aeroseal Duct Sealing is a patented breakthrough technology that tackles leaks from the inside out. Our Aeroseal software allows our technicians to measure the duct leakage in your home. Then by applying pressure to the ductwork and injecting an EPA-approved polymer, leaks as large as a nickel are sealed permanently. Afterwards, we will provide you with a certificate that proves we sealed your ducts. When you call Acree Air Conditioning for professional duct sealing service, we will conduct a thorough inspection of your air ducts to find weak points, imbalanced pressure points, and harmful materials. For proper duct sealing to occur, proper diagnostics and materials must be used. In addition to using Aeroseal technology, we double-check the soundness of your ductwork by securing connections and seams. Save Money & Energy – According to the EPA, the average U.S. home loses about 30% of its conditioned air through leaks in the ductwork. By sealing those leaks, more cool air gets to where it needs to go, increasing your comfort and lowering the stress and strain on your HVAC unit. Increased Comfort – Sealing your air ducts increases the air pressure and airflow going to your rooms. If you aren’t getting the power you need from your air conditioning system, you can probably fix it by sealing the air ducts. Hot and cold spots in your home are a common indication of an air leak, whether in your ductwork or your home. With Aeroseal, we can seal the leaks in your ductwork from the inside, reaching even the most inaccessible parts of your duct system with very minimal disruption to your home and routine. 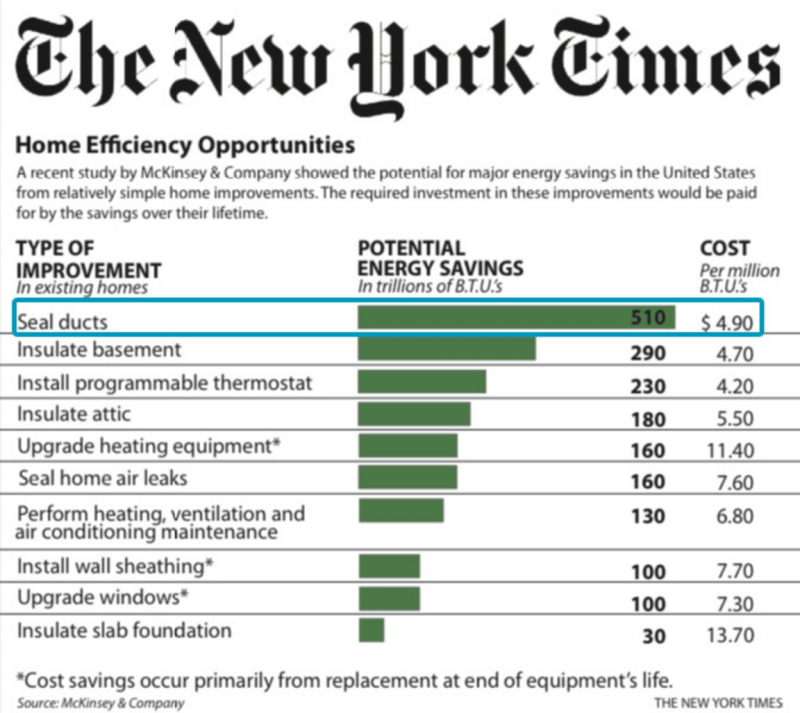 In terms of energy, no other single home improvement project can match the energy savings of whole-home duct sealing. Besides heating and cooling unused areas of the home, duct leaks can cause HVAC inefficiencies by up to 30%.